Carmen Boullosa, the internationally acclaimed Mexican writer, concludes The City College of New York’s sixth Cátedra Vargas Llosa, Friday, Oct. 26, with a lecture on Mario Vargas Llosa’s 2003 novel “El paraíso en la otra esquina” (The Way to Paradise). It starts 7 p.m. at the Instituto Cervantes of New York. Boullosa and Raquel Chang-Rodríguez, Distinguished Professor in City College’s Division of Humanities and the Arts, led the 2018 Cátedra that focused on El paraíso. The novel revolves around two non-fictional characters, the Peruvian Flora Tristán (1803-1844) -- a binational writer and activist who has been called the first feminist of the Americas -- and her grandson, the French painter Paul Gauguin (1848-1903). Boullosa and Chang-Rodríguez compared the two characters’ attitudes towards artistic creation, money, social institutions, notions of modernity, and “Primitivism.” They examined Flora Tristán’s memoirs, “Peregrinaciones de una paria” (1838); explored some of Gauguin´s paintings, and considered Vargas Llosa’s approach to narrative strategy as presented in his essays on the art of the novel. 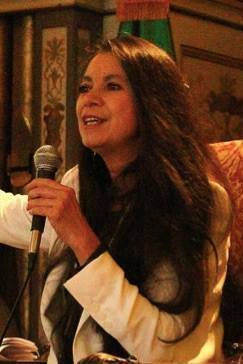 Boullosa is a visiting professor at the Macaulay Honors College at CCNY. For information on Boullosa’s lecture, contact CCNY’s Department of Classical and Modern Languages & Literature at 212-650-6731, or email rchangrodriguez@ccny.cuny.edu . Launched at CCNY in 2013 as the first of its kind in the United States, the Cátedra Vargas Llosa is offered through CCNY’s Department of Classical and Modern Languages and Literatures, with the cooperation of the Instituto Cervantes. It honors the Peruvian-born Nobel laureate.